Charmpilas N., Kounakis K. and Tavernarakis N. (2017) Monitoring mitophagy during ageing in Caenorhabditis elegans. Methods in Molecular Biology, DOI: 10.1007/7651_2017_18. Rieckher M., Meyer H., Ripoll J. and Tavernarakis N. (2011) Microscopic optical projection tomography in vivo. PLoS One, 6: e18963. Aviles-Espinosa R., Tserevelakis G. J., C. O. Santos S. I., Filippidis G., Krmpot A. J., Vlachos M., Tavernarakis N. , Brodschelm A., Kaenders W., Artigas D. and Loza-Alvarez P. (2010) Cell division stage in C. elegans imaged using third harmonic generation microscopy. In Biomedical Optics, OSA Technical Digest (Optical Society of America, 2010). Campagnola P.J., Loew L.M. (2003) Second-harmonic imaging microscopy for visualizing biomolecular arrays in cells, tissues and organisms. Nature Biotechnology 21: 1356-1360. Strachan C. J., Windbergs M., Offerhaus H. L. (2011) Pharmaceutical applications of non-linear imaging. Int J Pharm. 417: 163-172. Schmolze D. B., Standley C., Fogarty K. E., Fischer A. H. (2011) Advances in microscopy techniques. Arch Pathol Lab Med. 135: 255-263. Scheibe S., Dorostkar M. M., Seebacher C., Uhl R., Lison F., Herms J. 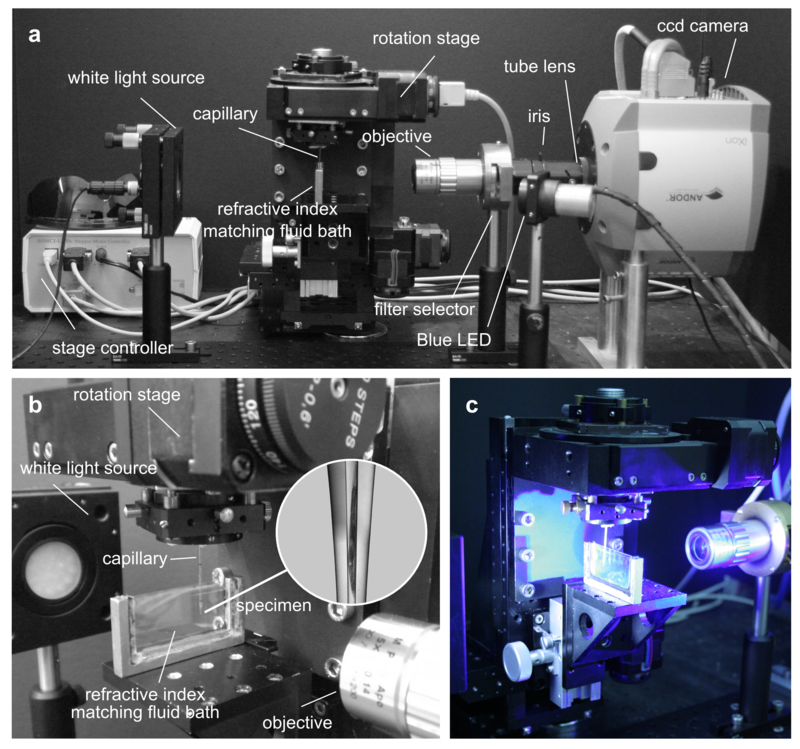 (2011) 4D in in vivo 2-photon laser scanning fluorescence microscopy with sample motion in 6 degrees of freedom. J Neurosci Methods. 200: 47-53. Chu S.W., Chen S.Y., Tsai T.H., Liu T.M., Lin C.Y., Tsai H.J., Sun C.K. (2003) In vivo developmental biology study using noninvasive multi-harmonic generation microscopy. Optics Express 11: 3093-3099. Muller M., Squier J., Wilson K.R., Brakenhoff G.J. (1998) 3D microscopy of transparent objects using third-harmonic generation. Journal of Microscopy 191: 266-274. Squier J., Muller M. (2001) High resolution nonlinear microscopy: a review of sources and methods for achieving optimal imaging. Review of Scientific Instruments 72: 2855-2867. Zipfel W.R., Williams R.M., Webb W.W. (2003) Nonlinear magic: multiphoton microscopy in the biosciences. Nature Biotechnology 21: 1369-1377. Mohler W., Millard A.C., Campagnola P.J. (2003) Second harmonic generation imaging of endogenous structural proteins. Methods 29: 97-109. Moreaux L., Sandre O., Blanchard-Desce M., Mertz J. (2000) Membrane imaging by simultaneous second-harmonic and two-photon microscopy. Opt. Lett. 25: 320-322. Xu C., Zipfel W., Shear J.B., Williams R.M., Webb W.W. (1996) Multiphoton fluorescence excitation: new spectral windows for biological nonlinear microscopy. Proc. Natl. Acad. Sci.U.S.A. 93: 10763-10768. Yelin D., Silberberg Y. (1999) Laser scanning third-harmonic generation microscopy in biology. Opt. Express 5: 169-175. Zipfel W.R., Williams R.M., Christie R., Nikitin A.Y., Hyman B.T., Webb W.W. (2003) Live tissue intrinsic emission microscopy using multiphoton-excited native fluorescence and second harmonic generation. Proc. Natl. Acad. Sci. U.S.A. 100: 7075-7080. Zoumi A., Yeh A., Tromberg B.J. (2002) Imaging cells and extracellular matrix in vivo by using second-harmonic generation and two-photon excited fluorescence. Proc. Natl. Acad. Sci. U.S.A. 99: 11014-11019. Cox G., Sheppard C.J.R. (2004) Practical limits of resolution in confocal and non-linear microscopy. Microsc. Res. Tech. 63: 18-22. Patterson G.H., Piston D.W. (2000) Photobleaching in two-photon excitation microscopy. Biophys J. 78: 2159-2162. Diaspro A, Bianchini P, Vicidomini G, Faretta M, Ramoino P, Usai C. (2006) Multi-photon excitation microscopy. Biomed Eng Online 5: 36. Biskup C, Zimmer T, Kelbauskas L, Hoffmann B, Klocker N, Becker W, Bergmann A, Benndorf K. (2007) Multi-dimensional fluorescence lifetime and FRET measurements. Microsc Res Tech 70: 442-51. Debarre D., Supatto W., Beaurepaire E. (2005) Structure sensitivity in third harmonic generation microscopy. Optics Letters 30: 2134-2136. Friedl P., Wolf K., von Andrian U.H., Harms G. (2007) Biological second and third harmonic generation microscopy. Curr Protoc Cell Biol. Chapter 4, Unit 4.15. Debarre D., Supatto W., Pena A.M., Fabre A., Tordjmann T., Combettes L., Schanne-Klein M.C., Beaurepaire E. (2006) Imaging lipid bodies in cells and tissues using third-harmonic generation microscopy. Nat Methods 3: 47-53. Williams R.M., Zipfel W.R., Webb W.W. (2001) Multiphoton microscopy in biological research. Curr Opin Chem Biol. 5: 603-608. Schaller R.D., JohnsonJ.C., Saykally R.J. (2003) Time-Resolved Second Harmonic Generation Near-Field Scanning Optical Microscopy. ChemPhysChem 4: 1243-1247. Sacconi L., Dombeck D.A., Webb W.W. (2005) Overcoming photodamage in second-harmonic generation microscopy: Real-time optical recording of neuronal action potentials. Proc. Natl. Acad. Sci. U.S.A. 103: 3124-3129. Faez S., Johnson P.M., Mazurenko D.A., Lagendijk A. (2009) Experimental observation of second-harmonic generation and diffusion inside random media. J. Opt. Soc. Am. B 26: 235-243. Yew E.Y.S., Sheppard C.J.R. (2007) Second harmonic generation polarization microscopy with tightly focused linearly and radially polarized beams. Optics Communications 275: 453-457. Yelin D., Silberberg Y. (1999) Laser scanning third-harmonic-generation microscopy in biology. Opt. Express 5: 169-175. Muller M., Squier J., Wilsons K.R., Brakenhoff G.J. (1998) 3D microscopy of transparent objects using third-harmonic generation. Journal of Microscopy 191: 266-274. Barad Y., Eisenberg H., Horowitz M., Silberberg Y. (1997) Nonlinear scanning laser microscopy by third harmonic generation. Appl. Phys. Lett. 70: 922-924. Assanto G., Stegeman G. I. (2001) Nonlinear Optics, Basics - Cascading. Encyclopedia of Materials: Science and Technology ISBN: 0-08-0431526: 6255-6259. Yang S., Zhan Q. (2008) Third-harmonic generation microscopy with tightly focused radial polarization. Journal of Optics A: Pure and Applied Optics 10: 125103. Batchelder D.N., Cheng C., Pitt G.D. (1993) Molecular Imaging by Raman Microscopy. Advanced Materials 3: 566-568.